It’s often said that Chicago is a tale of two cities – with some neighborhoods ignored, devoid of jobs and businesses, filled with poverty and crime, while other areas reap the benefits of safe streets and investment. A deep divide, to be sure, illustrating serious economic – and racial – disparities. Now a local photographer is trying to bridge that gap through a unique project of pictures, and more – taking and showcasing photos of opposite sides of the city (a home on the South Side, and its inverse property on the North Side, with the same street and number) and, when possible, also introducing the respective occupants to each other. Hear from Tonika Johnson and the “Map Twins” in this week’s episode of The Byline. The aim: Illustrate and chip away at the inequities between different parts of the city. “I want people to understand that it’s very easy, in Chicago specifically, to challenge yourself, to go to different neighborhoods,” said Tonika Johnson, who grew up in the Englewood neighborhood on the South Side. Johnson, who is the force behind the “Folded Map” project and exhibit, said she began the project by photographing the homes, but she decided to take the project one step further and asked residents if they would like to be directly involved and meet one another. To her surprise, many agreed. Growing up curious about Chicago’s segregation, Johnson said the idea for “Folded Map” had been brewing long before it came into fruition. “My whole life has kind of led up to me creating the ‘Folded Map’ project,” Johnson, 39, said. Johnson had photographed her own neighborhood through her “Everyday Englewood” project, but with “Folded Map,” she said she wanted to take her work outside of her comfort zone — and force her fellow Chicagoans outside of theirs. She paired residents from either side of the city together, gathering four sets of “map twins” to participate in the final product. 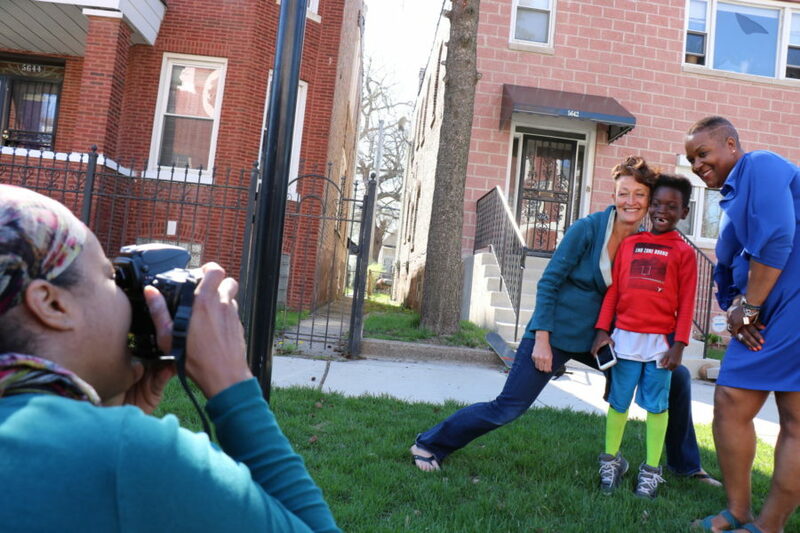 Brighid O’Shaughnessy, a former Rogers Park resident, was selected as one of Johnson’s “map twins,” paired up with Carmen Arnold-Stratton from Englewood. Both women lived on Winchester Avenue at the time — O’Shaughnessy on North Winchester Avenue and Arnold-Stratton on South Winchester Avenue. O’Shaughnessy, who used to run Erasing the Distance, a theater company that used the arts to encourage conversation about mental health, said she was drawn to the project because of its use of art and creativity to show a problem in a new light. Upon receiving a letter from Johnson inviting her to participate in the project, O’Shaughnessy didn’t waste any time agreeing to be featured. As far as O’Shaughnessy’s connection to Johnson, it was a perfect fit. Arnold-Stratton knew Johnson previously through their work with the Resident Association of Greater Englewood, a community organization in the neighborhood. She was drawn to the project because of its intention to show similarities among residents. “Someone that lives quote-unquote ‘in the ghetto’ may still want the same things as someone ]who] lives in a middle class neighborhood wants,” Arnold-Stratton said. Johnson photographs O’Shaughnessy and her son with their map twin, Carmen. Photo courtesy of Tonika Johnson. O’Shaughnessy, who now lives in the Lakeview neighborhood, said she’d been to Englewood before “Folded Map” to do mental health advocacy work, so she wasn’t surprised by the conditions in the neighborhood — she said the boarded up buildings and vacant lots were expected. But, proving Johnson’s point, O’Shaughnessy said sitting with Arnold-Stratton in her home introduced a more personal perspective on segregation in the city. 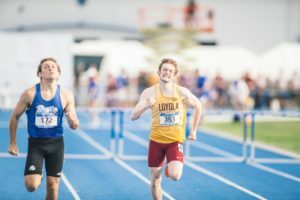 “It’s very different when you then go sit in someone’s home and you sit at someone’s kitchen table, and that was something that I had never had a chance to do before,” O’Shaughnessy said. O’Shaughnessy adopted her son from Haiti five years ago, and her experience as a member of a biracial family has changed her perspective on race and segregation. Arnold-Stratton picked up on this, and said she admires O’Shaughnessy’s commitment to understanding the others’ stories. Aside from the differences between their lives, O’Shaughnessy and Arnold-Stratton discovered unexpected similarities. Both women’s homes had been broken into, sparking them to analyze their relationship with their neighbors. This situation, along with others throughout her time in Rogers Park showed O’Shaughnessy that the neighborhood’s diversity doesn’t necessarily mean the neighborhood is a tight-knit community. Despite its status as one of the most racially and ethnically diverse neighborhoods in Chicago, O’Shaughnessy said she would’ve liked to see more unity. A few blocks away from O’Shaughnessy, Paula Herrmann lives with her husband Jonathan Silvers on North Hermitage Avenue. Their map twin, Maurice Pha’tal, lives more than 15 miles down the street on South Hermitage Avenue. Pha’tal, founder of an organization called “Think Outside Da Block,” which provides resources to children and teens in Englewood through mentorship programs, knew Johnson through their involvement with community activism in Englewood. He said he wasn’t sure what to expect when he began the project, but he wanted to help her in any way he could. Upon meeting Herrmann and Silvers, Pha’tal realized they had something in common. After meeting Pha’tal through “Folded Map,” Herrmann and Silvers took the trip to Englewood to participate in Pha’tal’s Roll in Peace event, a community bike ride around Englewood at night to promote unity in the neighborhood. 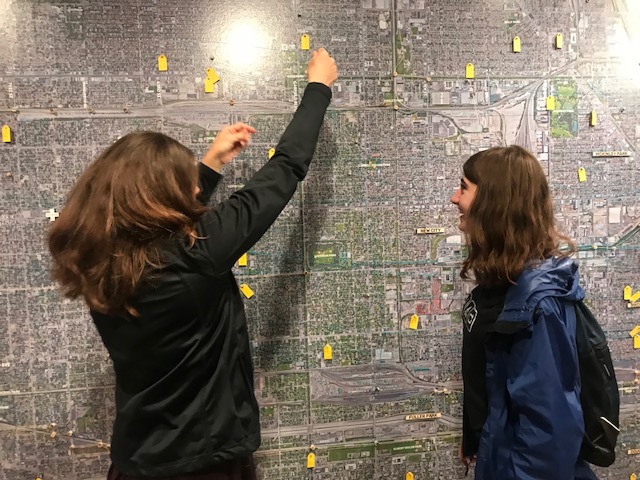 Johnson interviews the Hermitage map twins as part of “Folded Map.” They discuss resources in their Chicago neighborhoods. “I mentioned it, and then they showed up and tapped me on the shoulder and I turned around and I was super excited they came all the way from Rogers Park to ride the bikes at night,” Pha’tal said. Like Johnson, Herrmann and Pha’tal discussed the role of art in a social justice lens, saying a visual representation of segregation and disinvestment invokes a different reaction than words do. Through “Folded Map,” Pha’tal said he could see people’s perception of his neighborhood changing for the better. 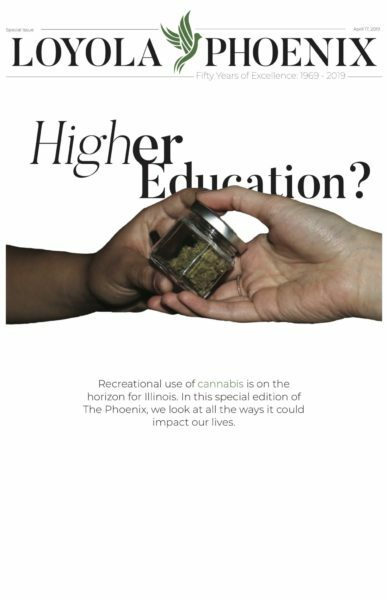 “To see people that have this perception that isn’t from Englewood and that don’t know about the good things that go on, the perception changed when they found out that it isn’t all bad,” Pha’tal said. 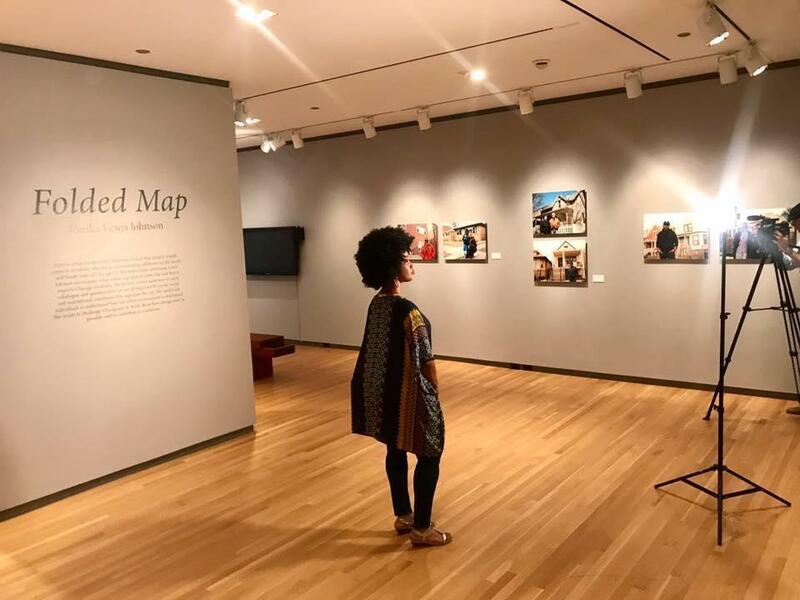 Last year, “Folded Map” was featured in the Loyola University Museum of Art (LUMA) after a group of Loyola students used Johnson’s art in a class project. 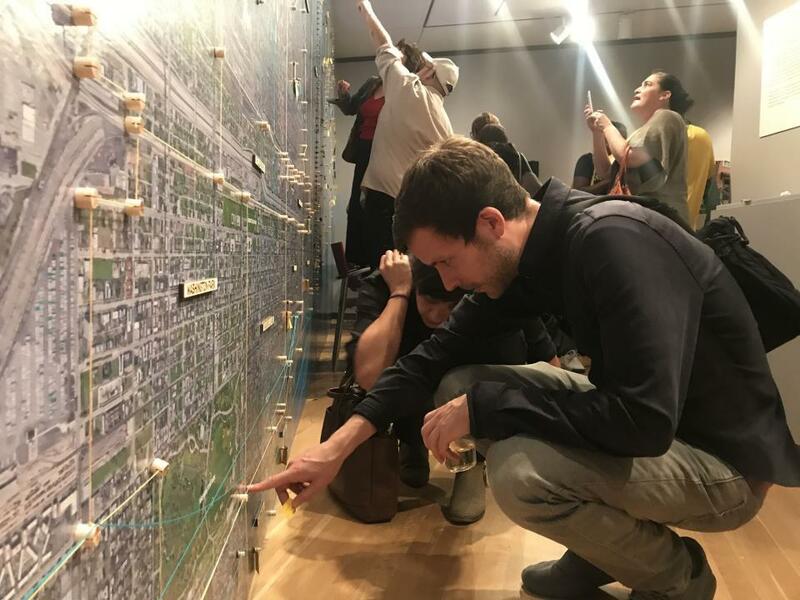 LUMA exhibited both “Everyday Englewood” and “Folded Map” in 2018 in part due to work done by Loyola students to show off Johnson’s work. Olivia Hill, who graduated from Loyola last May, was assigned to find a Chicago artist to feature in a project for Robert Morrison’s psychology of creativity class, and they ultimately decided on Johnson, who’s related to some Loyola alumni. On par with the comments made by some Rogers Park residents, Hill said she enjoyed experiencing different neighborhoods through art because it introduced a fresh view on a complicated topic. “I think [Johnson’s] work is just illuminating that there’s so much beauty in so many layers and there’s so much depth to Chicago,” Hill said. By the time “Folded Map” was exhibited at LUMA, its popularity skyrocketed. Ritsma said the exhibit was one of the largest successes in her three years at the museum. Because Chicago’s diversity and segregation are more complicated than splitting the city into North and South Sides, Johnson said she’s working on another installment to “Folded Map” by introducing the West Side into the mix. The project is underway and Johnson is researching addresses to be featured, she said. Along with another photography project, Johnson’s story is being shown through a theater adaptation of the project headed by map twin O’Shaughnessy and Collaboraction Theatre Company. O’Shaughnessy said people who saw the “Folded Map” exhibition seemed interested in a production piece, which sparked Johnson’s and O’Shaughnessy’s interest. The piece is part of Collaboraction’s yearly Encounter festival and is running through the end of the month. and marketing with Adwords. Anyway I am adding this RSS to my e-mail and can look out for much more of your respective interesting content.